Do you want a Samsung Galaxy Tab S 8.4? 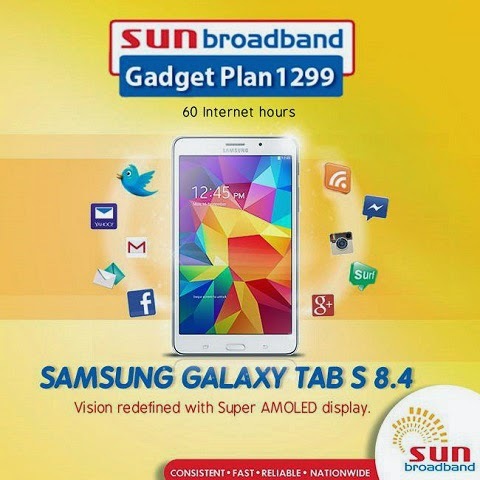 If yes, this is the opportunity to own a brand new Galaxy Tab S 8.4 because Sun Cellular offered the tablet for Php1,299 a month. This is a 24 months contract with a Sun Broadband Wireless SIM and a monthly 60 hours of internet surfing. In excess of 60 hours, subscribers will be charged P1.47 per 15 minutes of data usage. The Samsung Galaxy Tab S 8.4 comes in an 8.4-inch AMOLED display with Corning Gorilla Glass, 1.9GHz Samsung Exynos 5420 octa-core processor, 3GB of RAM, 16GB Internal Memory which can be expanded to up to 128GB, 8MP rear camera with LED flash, 2.1MP front-facing camera, LTE, Wi-Fi 80.211ac, Bluetooth 4.0LE, IR Blaster, Fingerprint Scanner, GPS w/ GLONASS and runs on an Andoid Kitkat.